Often illegally imported puppies, which are not vaccinated against rabies, are only ever discovered when a family take their new four legged friend for their first vet visit. At this point the puppy has to be seized and put in quarantine, with any costs incurred falling on the dog’s owners. Not only is there a significant financial implication, with fees in excess of £1,000, but the act of removing your cute new four legged friend can be extremely distressing and stressful. Under legislation, any dogs entering the UK must have been vaccinated against rabies – however the vaccine will not work if given to puppies younger than 12 weeks. 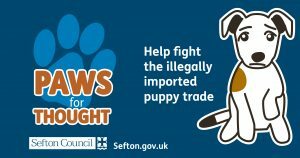 As a result Sefton Council’s Trading Standards team are urging those considering buying a puppy to make sure they know who they are buying from, to check the pup’s vaccination history and always ask to see documentation. The campaign launches after five people were prosecuted after the Trading Standards team uncovered an illegal puppy smuggling operation on Skipton Avenue, Southport. “We don’t want people to have their lovely new puppies taken away from them. “But illegally imported and unvaccinated puppies are an issue, and it is something which can happen in Sefton as we have seen recently. “The puppies we discovered in Southport were only around eight weeks old when they were brought into the UK, meaning even if they had been vaccinated it would not have been effective. “Increasing numbers of puppies are being imported illegally in to the UK from puppy farms in Eastern Europe. “These puppies are being sold via adverts on the internet and are accompanied by false and forged documentation which lead buyers to believe they have been imported legally or bred in the UK. • If the puppy has been vaccinated ask to see the documentation. This must clearly state the veterinary practice where this was carried out. • Be suspicious if the address of the veterinary practice is outside the UK. • If the puppy has been brought in from outside the UK, it must be at least 15 weeks old and have a pet passport or a veterinary certificate. • Never agree to have the puppy delivered to your home address or to meet the seller to collect the puppy. • Never pay for a puppy in advance. Earlier this year a joint raid by Sefton Council and Merseyside Police at a Skipton Avenue property discovered seven illegally imported puppies being kept in a poor condition. Sefton’s Trading Standards team had no choice but to seize the puppies and put them in quarantine. Fears that the pups were too young to be vaccinated against rabies were later confirmed and sadly one puppy was so ill, it had to be put to sleep. The remaining six puppies were later successfully rehomed. “We know that our communities have felt absolutely devastated since the announcement in August by Highways England that their preferred option is to build a dual carriageway through Rimrose Valley. The way the whole process has been handled beggars believe and the more I have thought about it, the more I believe that we have grounds to challenge and are calling for a judicial review on the matter. “When they first started consultation on their two options to ease traffic on the A5036 – a revamped A5036 Dunnings Bridge Road, which is already one of the busiest roads in the north, or a new £200m road through Rimrose Valley Park in Litherland – we put forward a third option to build a tunnel as an alternative and felt it should have been properly looked at. Yet they completely disregarded this option without any real consideration. “We want to do the best by our communities and I feel that this flawed decision needs to be challenged. It’s just not right that they can do this to the people of Sefton. Their failure to include the tunnel as an option in the consultation process has deprived our residents of the opportunity to express a view – and I think this gives us enough evidence to take legal action. We are calling on Highways England to withdraw its ridiculous decision and re-open the consultation, giving people an opportunity to comment on the possibility of a tunnel as another option. Sefton Council is urging residents to remember their duty of care when getting rid of household waste, in order to avoid huge flytipping fines. Many residents hire third parties to take away household waste and large bulky items from their home but most do not know the rules and regulations that cover these types of waste disposal. By law, individuals are required to make sure t he firm removing their waste is authorised to do so and is registered with the Environment Agency as an official waste carrier. In three recent cases in South Sefton, residents have fallen foul of rogue waste collectors who have simply dumped their waste as flytipping around the borough. If flytipped waste is traced back to a particular property, the householder could be fined up to £5,000 if they cannot properly identify who they used to get rid of their waste. “Recently we have experienced issues with members of the public not complying with their legal responsibilities to ensure any waste they produce is removed by a registered carrier. “This can be from the local paper, social media or shop noticeboard but the responsibility is with the household to check they are legitimate first before they employ them. “Ask to see their waste carrier license issued by the Environment Agency or contact the Environment Agency directly on 08708 506 506 and ask for a free instant Waste Carrier Validation Check. “Alternatively you can check online on the Environment Agency website. Litter louts who have been caught irresponsibly disposing of rubbish in Sefton have been convicted in court, leading to fines totaling more than £2,000. Eight people from Sefton and Lancashire failed to appear at South Sefton Magistrates court this week (Tuesday, October 17) after they were spotted by enforcement officers littering in the borough. They were found guilty in their absence and each given 28 days to pay a fine. Rachel Colbeck, 31, of Stanley Road, Bootle; fined £272. Jamie Gretton, 23, of Milton Street, Bootle; fined £272. David Morris, 30, of Covent Close, Ormskirk; fined £272. Tegan O’Neill, 20, of Saunders Street, Southport; fined £272. Steven McIntosh, 46, of Beech Trees, Skelmersdale; fined £272. Gheorghe Becherescu, 32, of Bedford Road, Birkdale; fined £272. Melissa Davies, 31 of Bedford Road, Birkdale; fined £272. Melissa Taylor, 23, of the Corners, Thornton, Cleveleys; fined £272. “It’s simple. If you drop litter and our enforcement officers catch you, you will be fined £75. “If you fail to pay and your case goes to court, then the fine can be considerably higher. “It’s a criminal offence to litter and we will not hesitate to fine those who deliberately make our beautiful borough untidy. For more information about litter, visit www.sefton.gov.uk/bins-recycling/litter-and-fly-tipping.